All of us should have heard about Hurricane Irma by now. This is without question one of the largest and most devastating hurricanes in a long while. Characterized by intense rainfall, strong winds, and massive storms, the result has been a devastated landscape completed with roofs torn from buildings and homes left utterly in ruins. Entire towns have been evacuated, the highways are jammed with traffic, and the list goes on. Where Did Hurricane Irma Originate? This is all due to Hurricane Irma, which originated on the 30th of August near the African island nation of Cape Verde. Most of the destruction of Hurricane Irma was dealt on the 7th of September. In fact, this was the most active day for any hurricanes from the Atlantic in recorded history. Reaching the levels of a category 5 storm, Hurricane Irma inflicted significant damage and destruction. By the 9th of September, the hurricane reached the island nation of Cuba. Wind speeds topped one hundred and twenty miles per hour and the winds and rain were extremely destructive and heavy. Before then, on the 8th of September, wind speeds were one hundred and sixty miles per hour. It was the most powerful hurricane to strike Cuba since 1924. On the 10th of September, Hurricane Irma reached Florida with wind speeds of one hundred and thirty miles per hour. Everything in its path was completely and utterly destroyed, including power lines. By the following day, the strength of the storm had thankfully dropped considerably, but it still caused heavy winds and rainfall in Georgia and other states along the east coast. 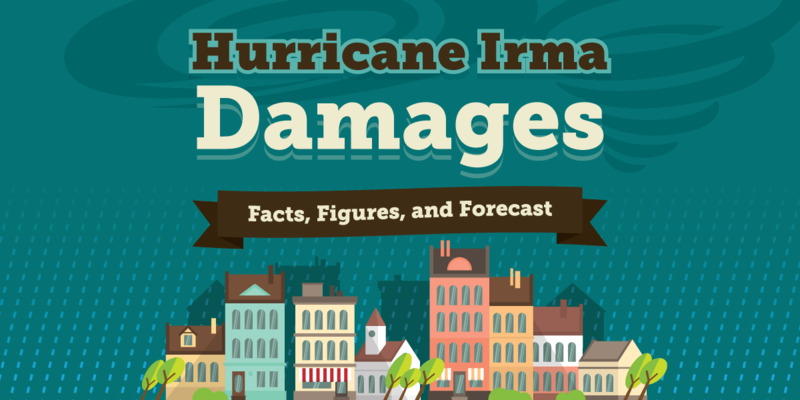 You should check out this infographic we have created that details the effects of Hurricane Irma and the responses of some of the witnesses and residents. Irma actually made landfall twice in Florida on Sunday. First it struck the Florida Keys, and then it struck Marco Island. The effects of the hurricane on the people of Florida was enormous. There were mass evacuations prior to the hurricane, and gas and fuel shortages added to the complexity of the situation. Massive damage was also dealt to the power lines, and areas that did not even come into direct contact with the hurricane still experienced flooding. In total, Florida received over sixteen inches of rain. Of course, numerous flights were cancelled as well. Over four hundred thousand vehicles were obliterated from Hurricane Irma, along with seven million wire line subscribes and online cables. Millions of lives have been affected by Hurricane Irma. The International Red Cross estimates that 1.2 million lives alone were affected by the Hurricane so far, and it is estimated that that figure may climb as dramatically to 26 million at the end. Hurricane Irma and hurricanes in general are only one example of a massive natural disaster that can impact our lives and cause people to have to evacuate their homes and abandon their possessions. If you have yet to come up with a disaster preparedness plan for natural disasters in your specific area, you need to start coming up with one as soon as possible.